With Remote Sync you can outsource file hosting to an external service. WP-Filebase syncs with a folder on the service and adds files recursivly. It once downloads all files and scans it for thumbnails and extended file info (ID3 tags). Then the file is deleted and an external download link is created. Downloads will be redirected to that links without causing any data traffic on the blog server. Foreach sub folder a category is created, so the folder structure will be the same like on the remote service. Just enter the FTP details (host, user, password) and select a folder to sync with. A HTTP Url can be specified to map downloads to HTTP instead of FTP when downloading. You can connect WP-Filebase to your Dropbox account. After connecting, use the AJAX browser to select a directory in your Dropbox to sync with. You can choose if downloads links are pointing to the file or a Dropbox preview page. Note that forcing downloads does not work with files hosted on Dropbox! 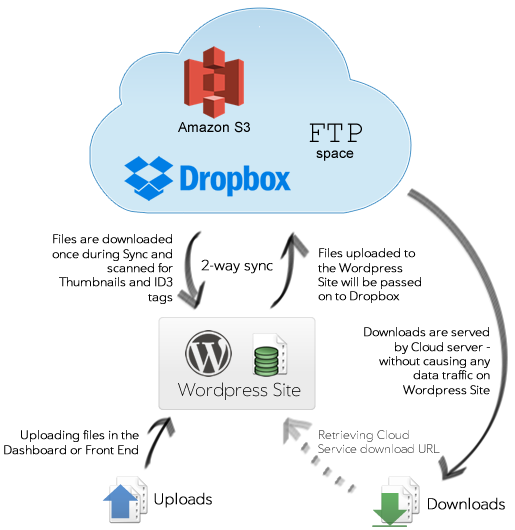 With an AWS access key and secret you can easily add files from a S3 bucket. The (virtual) path names of the files inside the bucket are mapped to category structure. You can sync whole buckets or only files inside a directory, i.e with a certain path prefix. WP-Filebase Pro includes a bucket explorer, so you can browse through buckets and select the directory to sync. Files stored in Google Drive can be synced. Syncing of documents created in Google Docs is not supported yet. With this extension WP-Filebase can sync with any WebDav server. This includes ownCloud servers and box.com. We have a OneDrive extension too. A more advanced scenario is the Master-Slave Syncing: multiple WordPress Sites share some or all files, while files are only stored at the Master Site. Slave sites are using the FTP Sync to retrieve the Master Files and upload new files (2-way sync). Once you set up a dropbox sync, how often does the sync happen? Do you need to run it manually? I paid for the dropbox addon however have not been able to workout where to download it – can you please direct me to the right spot? How are the capabilities to add, edit or run cloud syncs controlled? I do not see those capabilities listed on the Permissions page under Settings for Filebase. I setup a webdav storage with username and password and wp-filebase does move files there. But when a visitor clicks on a download link they get asked for login credentials. Where did I go wrong? This plugin is supposed to work with cloud storage which a username and password right? How can I make this work? I tried FTP sync in demo site. I needed to manually push “Filebase sync” button in order to get file sync. In real site, can FTP sync automatically? Does using Cloud sync (one drive for example) stops filebase from using its folder “\uploads\filebase”, or both can to be used at the same time?